OLYMPIA—As temperatures rise across our state this season, the Department of Licensing (DOL) would like to remind drivers to watch out for an increasing number of motorcycles on our streets and highways.Riders can be difficult to see on busy roads because of their smaller size and profile. Motorists should take an extra second to be aware of what’s around them. An extra look could save a life. DOL will continue the agency’s “Look Twice, Save a Life” public information campaign this summer to work on increasing motorist awareness of motorcycles. Since 2008, the number of other drivers failing to yield the right of way to motorcyclists has dropped by approximately 20 percent, according to collision data compiled by the Washington State Department of Transportation. Gov. 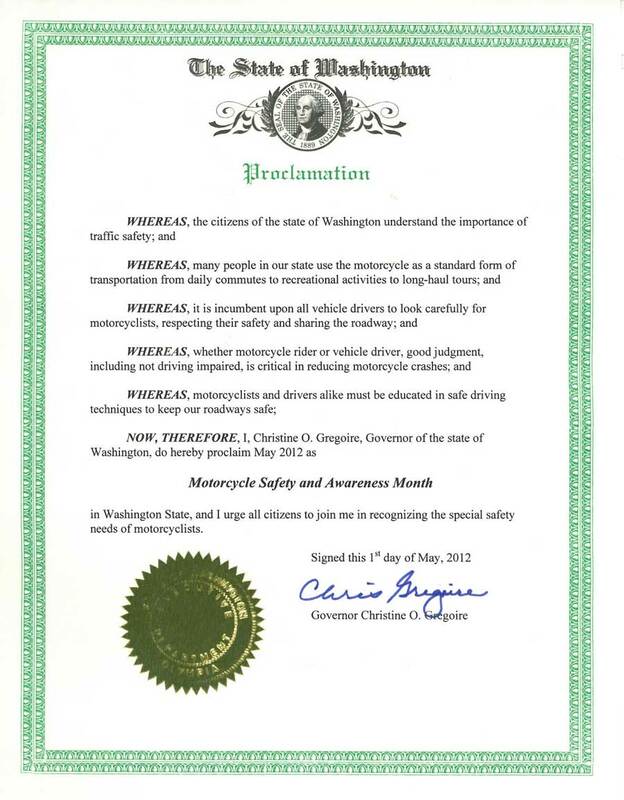 Chris Gregoire issued a proclamation declaring May as Motorcycle Safety and Awareness Month and called on motorcyclists and drivers alike to work on improving motorcycle safety this year. The top three rider-causes of motorcycle crashes are alcohol or drug impairment, improper lane position and speeding. To legally operate a motorcycle on Washington roads, riders must have a driver license endorsement—or they could see their bike impounded even after a simple traffic stop. DOL Director Alan Haight encourages all riders to take advantage of our state’s excellent network of motorcycle training schools. You are currently browsing the Licensing Express blog archives for May, 2012.